Kit of magnets and accessories for science experiments. A kit of magnets and accessories in a compartmental storage tray. 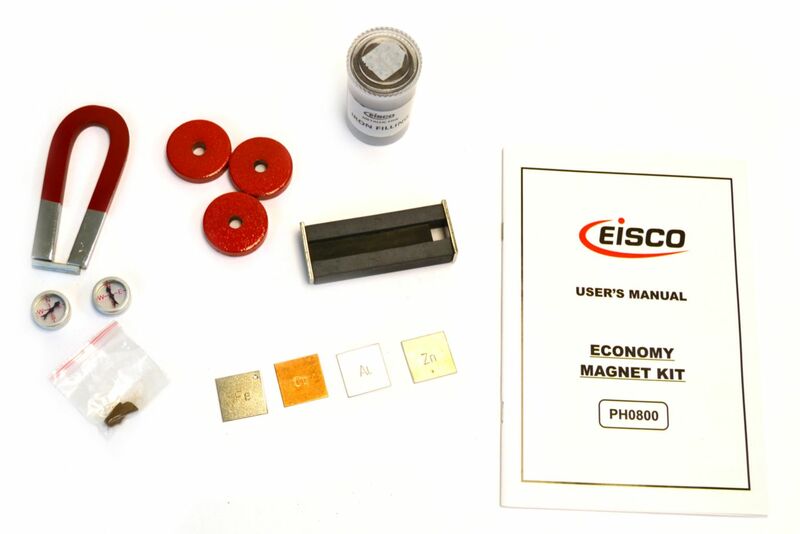 Contents: 1 Horseshoe magnet with keeper, 100 mm 2 Ceramic bar magnets 75 mm Long. 3 Ceramic ring magnets, 38 mm diameter, face polarized. 2 Plotting compasses, clear both sides, 19 mm dia. 1 Pack Iron Filing. 1 Pc. Each of square iron, aluminum, zinc and copper metal. Ordering information: Kit contains 1 Horseshoe magnet with keeper, 100 mm 2 Ceramic bar magnets 75 mm Long, 3 Ceramic ring magnets, 38 mm diameter, face polarized, 2 Plotting compasses, clear both sides, 19 mm diameter and 1 Pack Iron Filing, 1 Pc. Each of square iron, aluminum, zinc and copper metal.